The strawberries in my garden are finally starting to ripen. Mary Beth and I picked a few pounds of them earlier tonight, then had a wonderful dessert of berries and cream. OK, the cream was Redi Whip, but it was still a YUMMY dessert! We only picked from the "overflow" area, where the strawberries have started to take over beyond their original bed. The main bed still hasn't ripened. I'll probably have five or six times as many berries once I harvest the rest of the patch. 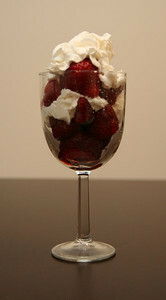 I'm going to have to find a few new recipies, or at least find some friends/coworkers who like strawberries.